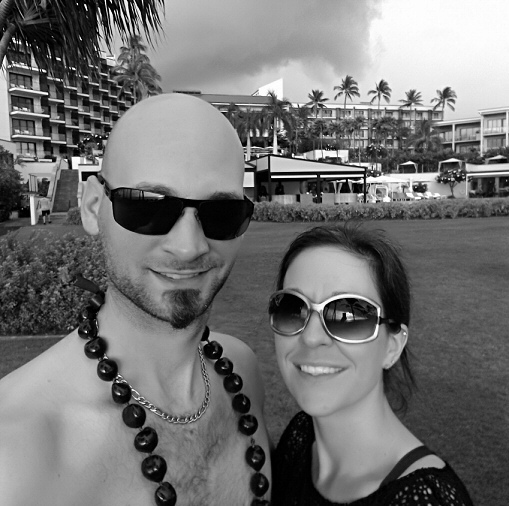 Our stay at the Andaz Maui at Wailea was definitely one of the highlights of our recent Hawai’ian get-away. The property is beyond beautiful, the beach is top notch, and the service and little extras made the whole stay seem extra-special. The staff made us feel like VIPs, which I guess is to be expected for the $439/night price tag. But this is ValueTactics you’re reading, so we paid $26.25/night! More on that in a bit . . . 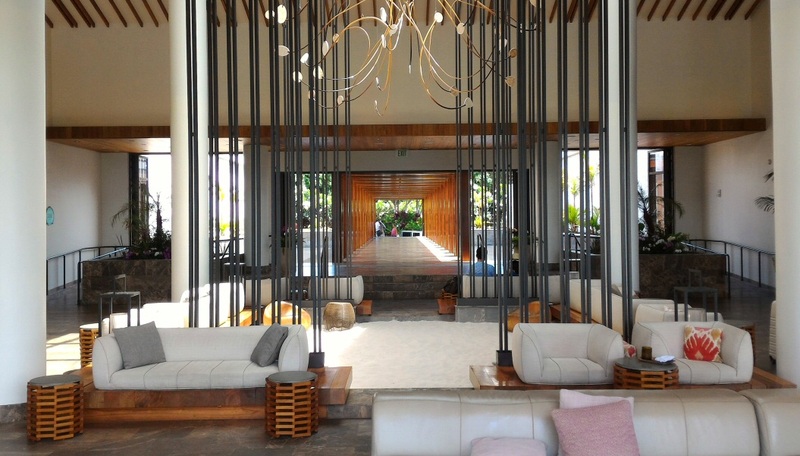 The Andaz Maui is a new resort, only 3 years old at the time of this writing. Andaz hotels are part of Hyatt’s portfolio and are branded as chic, luxury boutique hotels. The property has 297 rooms and suites, several condos and for-sale villas, 5 swimming pools, multiple dining options, a full service spa, and a full service beach club. Our 4 night stay wasn’t even close to enough time to see and do all this resort has to offer. 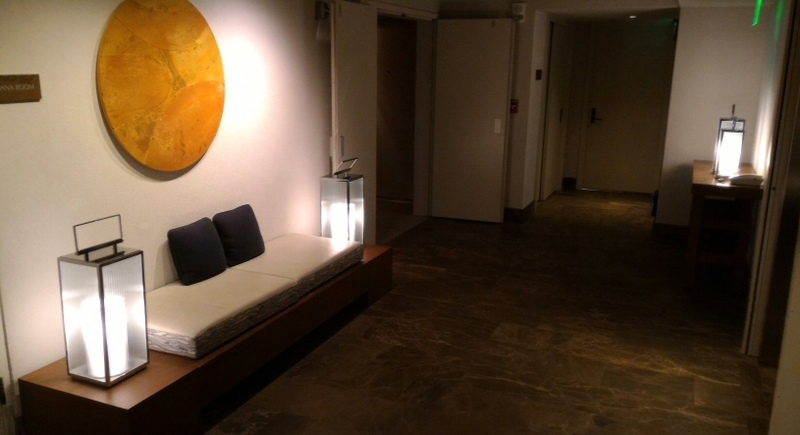 View toward the front entrance from the main lobby, where you can find the front desk, concierge, and zen garden. 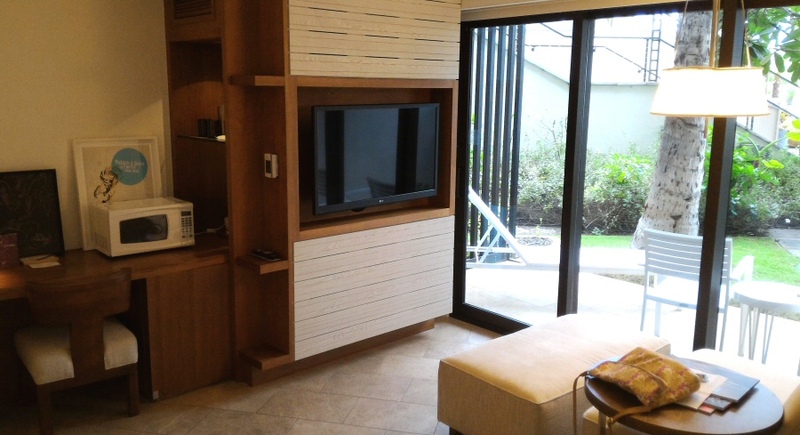 The room is equipped with a large flat screen TV with a fully adjustable mounting arm. The TV inputs are located in the snack cabinet next to it. I wish I would have brought an HDMI cable so we could have watched streaming TV and movies from my laptop. The microwave and the fridge had to be requested from the front desk (via the bellman) and were subject to availability. If these hadn’t been available, we were going to consider buying one of each from Walmart and then leaving them in the room upon our departure. (I think this is where the hotel’s collection of random microwaves and mini-fridges comes from in the first place.) With a breakfast buffet price of $50 per person, it doesn’t take much math to figure out that even a few meals prepared in the room would be worth the cost of the appliances. Restaurant leftovers could also be kept this way. Luckily they were available so we didn’t have to do the Walmart appliance tactic. 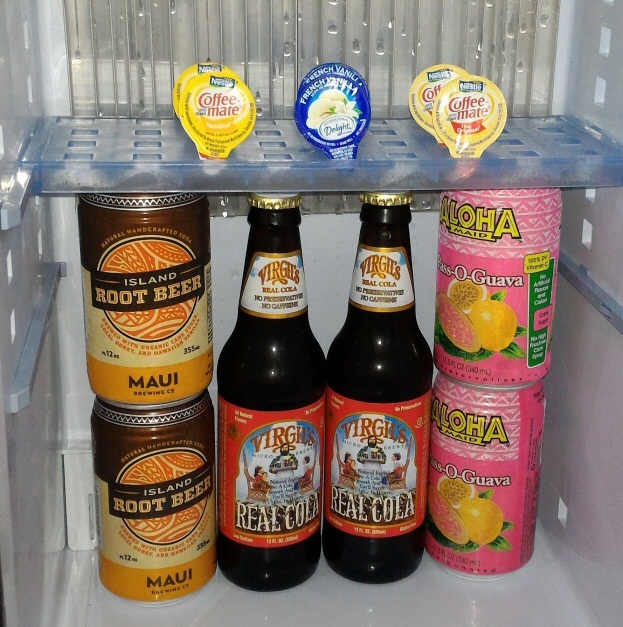 Although the room didn’t have a real fridge, there was a cooler cabinet built into the desk with complimentary Hawaiian pop (yes, it’s called “pop” -deal with it), juice, and gas station-type coffee creamers, which were replenished daily. 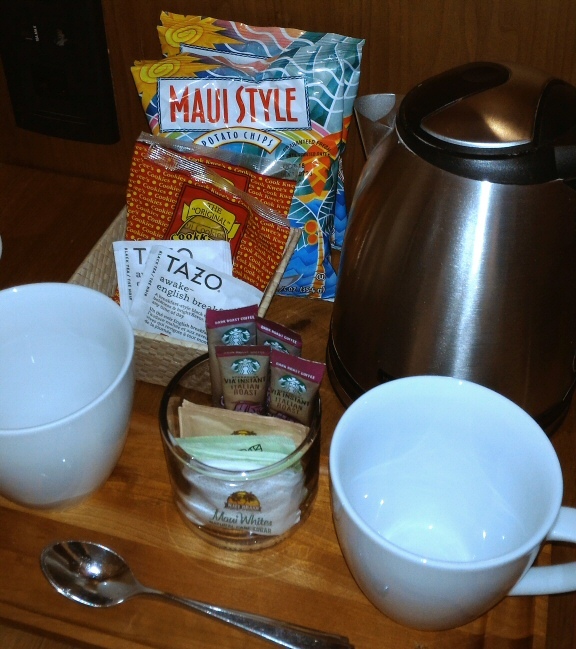 The complimentary Maui cookies, chips, and Starbucks instant coffee were also replenished daily. In the lobby brewed Kona coffee was available every morning. If you’re a late sleeper beware though; that coffee is only available until 9:00. I missed the cutoff one morning and had to settle for the instant Starbucks. 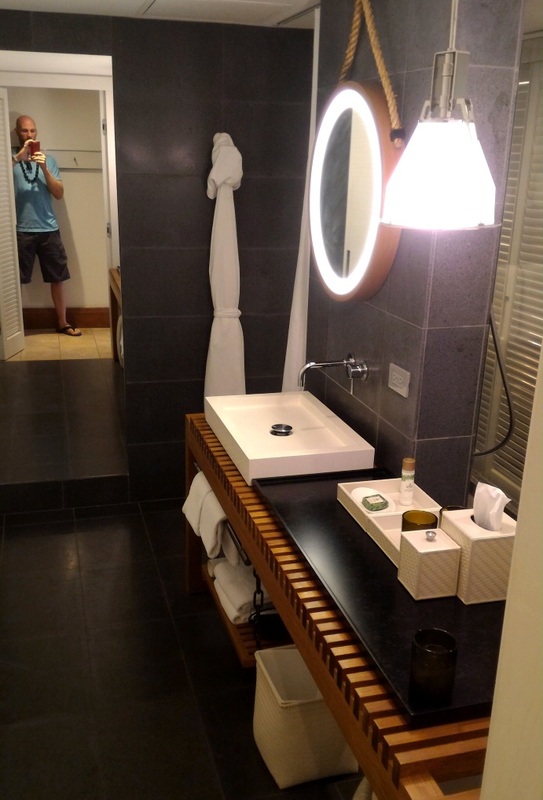 Some other reviews I have read complained about the weird layout of the bathroom. The long, narrow shower is between the vanity area and the bedroom, with a full height glass wall looking right into the bedroom. Sliding shutter doors can be closed from the bedroom side for privacy. The vanity top is fairly small, considering the wooden slat construction which isn’t very good for setting small items on. The toilet is in a separate closet room. I am a sucker for design and aesthetics. I can easily forgive the weirdness and the slight inconveniences of the bathroom for the sake of appearance. 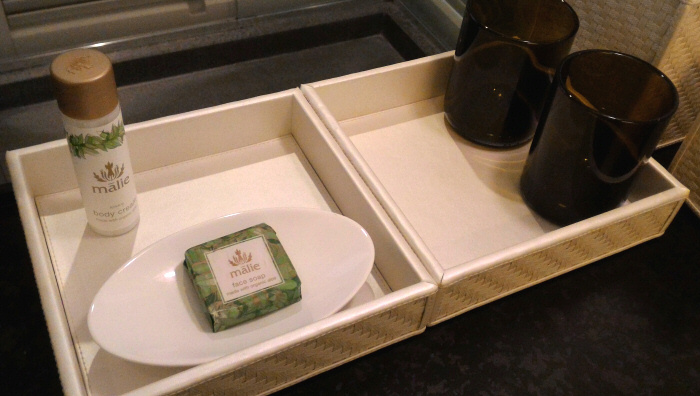 The surprise little amenity kit we discovered on the vanity. 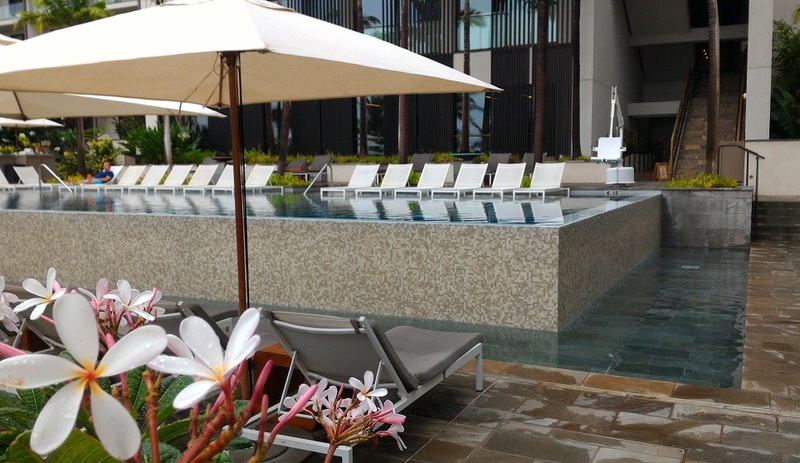 It’s no secret that Hyatt loves to highlight the cascading infinity pools at the Andaz Maui, and for good reason. These are easily the most interesting and unique pools at any hotel I’ve stayed at. And they are more than just architectural art. 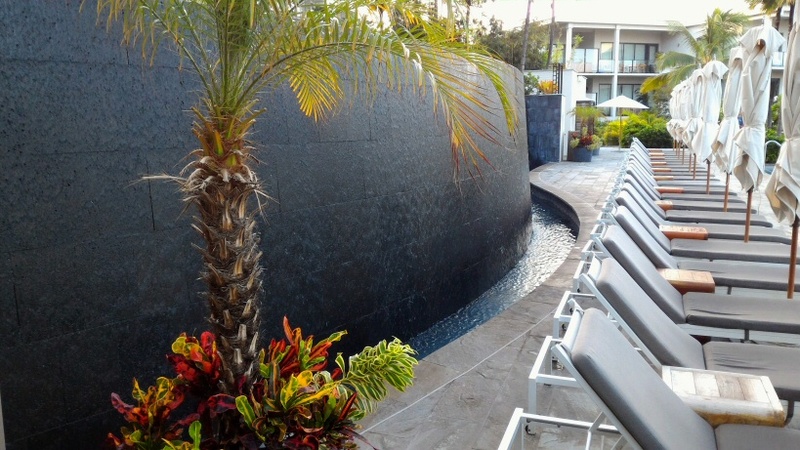 With a shallow depth and lots of nearby pool chairs they are perfect for wading around, swimming leisurely laps, or leaning on the infinity edge to watch the lovely Maui sunsets. We spent many hours just hanging out by the pools on our first couple days. Of course part of the convenience for us came from our ground floor room. Our drink refills, sunscreen, and e-book readers were a quick 10 second walk away. The hot tub and surrounding pool are open 24 hours, which is a feature I would have appreciated on many hotel stays elsewhere. There is a separate pool with half submerged lounge chairs that is for adults only. During our stay the “adults only” was pretty much a joke since we saw 3 kids, all infants or toddlers, the entire time. The bottom pool is zero entry, which is a nice feature, frequently enjoyed by those 3 toddlers and their moms. The towel stations were well stocked and also had complimentary sunscreen and infused water available. Pool attendants put seat covers on our pool chairs upon request. We never had a problem finding open chairs by the pool. However the hotel was not fully booked during our stay and we usually went out to the pool before most other guests, so take that for what it’s worth. Wailea Beach is supposedly rated one of the best in the world. From my somewhat limited experience, the high rating is definitely justified. The water was warm, clear, and the beach was 100% soft sand with absolutely no washed up plant matter. (And that’s saying something, considering we were there a week after a passing hurricane caused some rain and wind.) Great snorkeling reefs are scattered around the resort area, all accessible from shore. The beach in front of the Andaz is sandwiched between two such reefs. The surf was calm to start the day but as the day wore on it got up a bit, enough to do some body surfing by the afternoon, but never too wild to casually swim just out from the breaking waves. 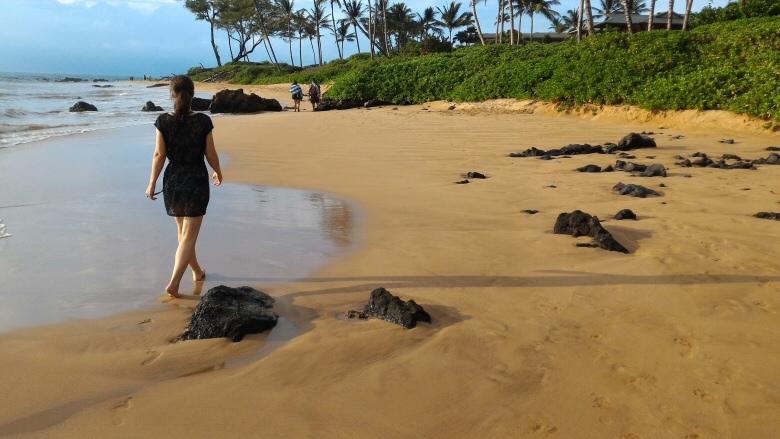 The $40/night resort fee at the Andaz Maui (covered for us since we booked with free night certificates) includes most of the offered rentals and beach activities. One morning we went on the outrigger canoe trip. It’s a 30 minute tour with a guide. (When you turn in your paddles to the rental hut, there is a chance to charge the guide’s tip to your sign-out slip.) We went a short way down the shore, past some neighboring properties. The guide pointed out some good snorkeling spots, talked about the other visible islands, and gave us a run down on what sea life we were likely to see at the current time of year. We were lucky enough to see a sea turtle- something on my bucket list for the trip. He was hanging out on the surface just ahead of us when the guide pointed him out. He then swam down and surfaced between the outrigger and my spot on the canoe, 2 feet away from me! He looked right at me and waved “hi” one time before diving down again. We also took advantage of the snorkel gear and boogie board rental. The apparently world class snorkeling, however, was ruined by murky waters caused by recent torrential rains. 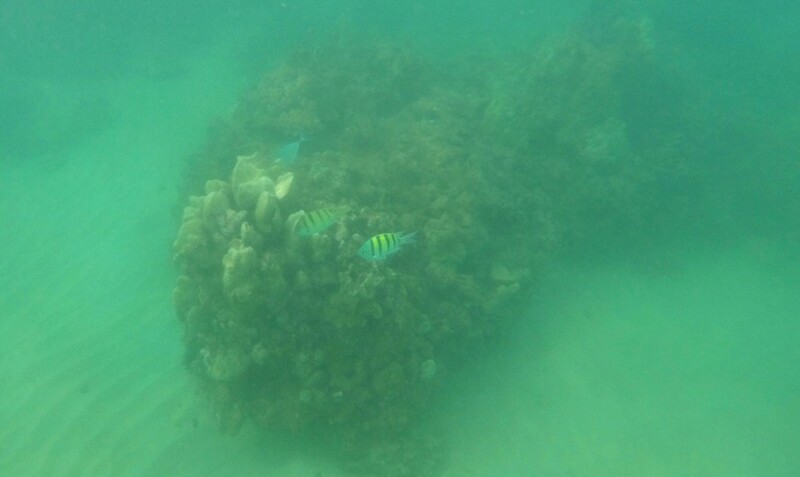 Some people we talked to reported better luck snorkeling with a paid, off-shore excursion. We considered one of those tours but never got around to it. This doctored photo shows how crummy the water conditions were for snorkeling. We did see a lot of colorful fish, but we’ll have to wait til next time for the whole experience! Another benefit included in the resort fee is complementary GoPro camera rentals, available at the concierge desk. GoPros are available from 6:00 in the morning until 8:00 at night, and are first come, first served. The camera came with a waterproof case, which was the main reason we wanted it. The photos above of our snorkeling attempt were taken on the GoPro. 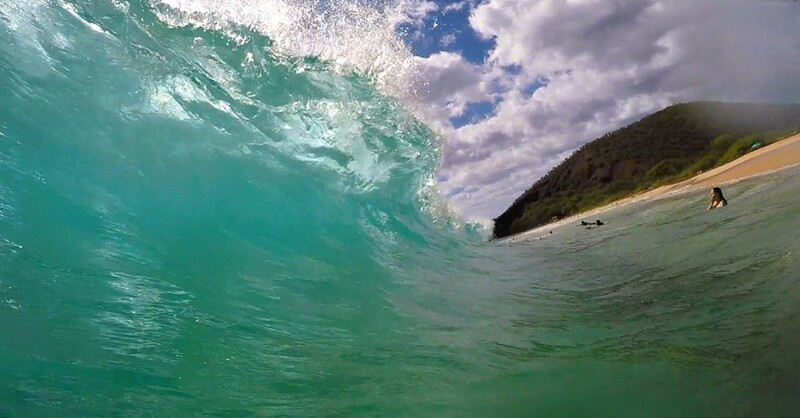 We also took it to nearby Makena Beach, more commonly known as “Big Beach.” The surf was much bigger here than at the hotel, and we got some pretty cool pictures with the GoPro. The concierge gave us a map and some tips for our trip to watch the sunrise on Haleakala. If you want to call it an amenity, we also used the [mandatory] valet parking. Getting our car was usually pretty fast, under 5 minutes. The only time it was a bit longer (10-15 minutes) was when we left around 4:30 PM for dinner one afternoon. The valet drivers were courteous and always offered to put our convertible top up or down for us, depending on whether we were picking up or dropping off. One thing to note is that calling ahead to say that we were coming for our car seemed to do absolutely nothing to reduce the wait time. The valet fee is $25 per night and there is no self-parking option at the hotel. This was the only expense not covered by the free night certificates! There is a 24 hour convenience store connected to the lobby, but most prices are even higher than you would imagine. Nicoleen went there to look for sunglasses after she lost hers and the selection was mostly Maui Jim brand, most with a $250+ price tag. On someone else’s review I saw a photo of a $24 six pack of Bud Light cans in this store. After a quick glance at the menu prices on the Andaz Maui website before our trip, we realized we wouldn’t be doing a lot of on-site dining. The breakfast is $50/person, cocktails are $17, and appetizers are in the $15-30 range. Needless to say, a dinner for two would easily be over $125 . . . and that would be on the cheap end. We never ate a sit-down meal at any of the on-site dining choices, but we did order a poolside snack one day. Menus from Bumbye Beach Bar (located by the zero entry pool) were brought around daily to sun worshipers by the pool. Nicoleen had her heart set on the waffle fries she had seen (and smelled) others eating. And I ordered a Pimm’s Rangoon; that 10 second walk to the room to get a drink refresh was looking pretty arduous at the time 😉 The cocktail was good but unremarkable. Same goes for the fries. With tip the damage was $30. We figured it was OK to splurge a tiny bit considering we were staying at one of Hawaii’s nicest resorts for nearly free! At the time of booking (over 9 months in advance) the published rate for the room we stayed in was $439 a night. With the $40 resort fee, $25 valet fee, and all taxes that total ends up at $539.56 per night. This trip was part of our Hawaiian get-away, a trip designed from the start to get extreme value out of a few strategically acquired new credit cards. Nicoleen and I each got Chase Hyatt cards last fall. Each card comes with a sign-up bonus of 2 free night certificates, good for the standard room type at any Hyatt property in the world. Between the 4 free night certificates we earned from these two cards, we got $2,158.24 in value! All we had to pay was the nightly valet fee, which totaled $106.40. I’d call that extreme value! Free nights with Hyatt Gold Passport points are 25,000 per night*. Hyatt Gold Passport points can be earned with paid stays at Hyatt properties, with regular spending on the Chase Hyatt card, or by transferring points from Chase Ultimate Rewards at a 1:1 ratio. 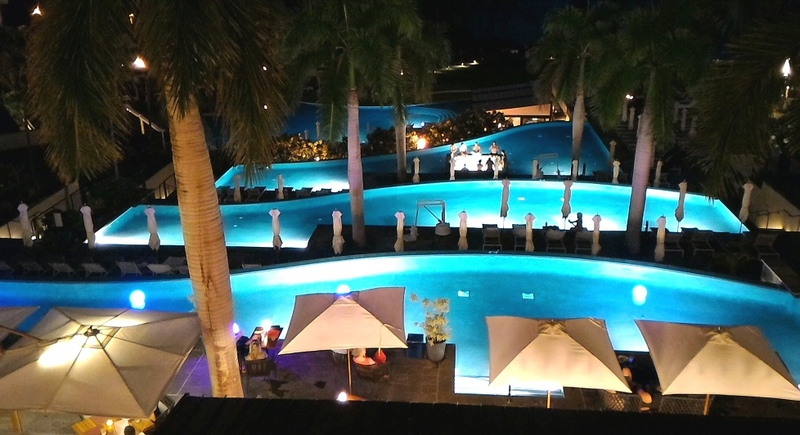 * Recently some Hyatt properties have been playing games with their reward night availability. 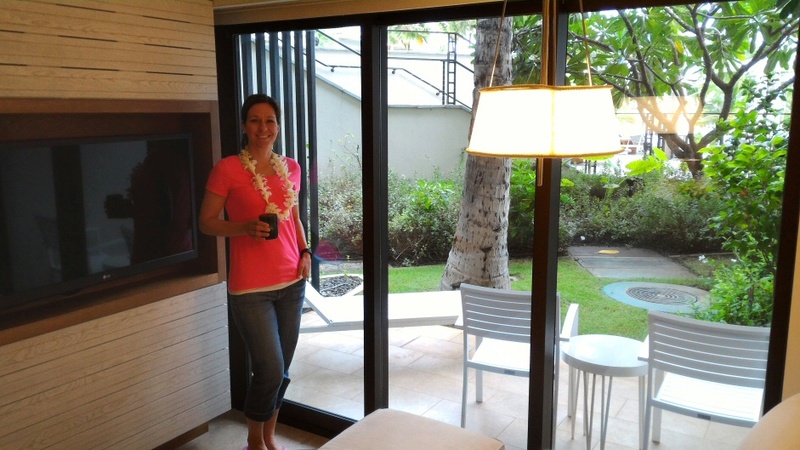 It may be difficult to find available reward stay (points or certificates) nights at the Andaz Maui. 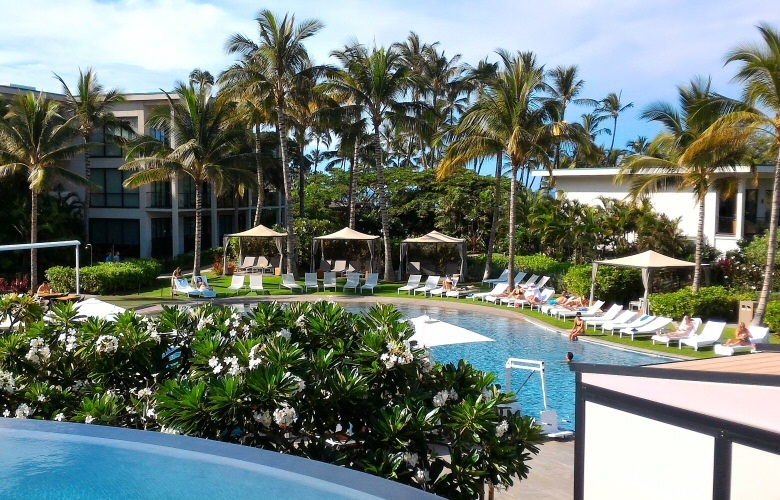 The Park Hyatt on Maui is also reportedly extremely nice and has widespread calendar availability for reward stays. See this Flyertalk post for more info. From the pictures posted here and elsewhere, I think you can see why everyone agrees the Andaz Maui at Wailea is an amazing property. 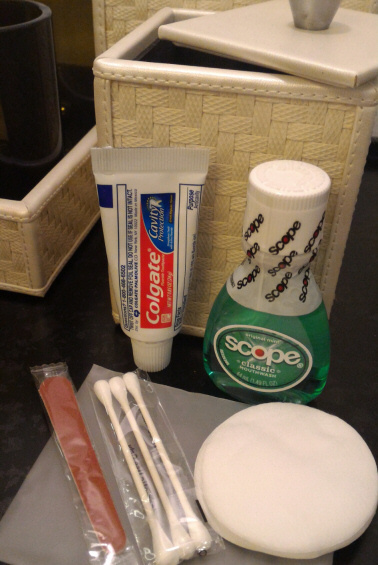 Some reviews I have read complained about unfriendly service by hotel staff. We didn’t find this to be the case at all; in our experience everyone was friendly and courteous. It seemed like they genuinely cared about guest experiences. One night our air conditioning refused to stay on longer than 10 seconds. It was 1:30 in the morning and a technician was there to fix it within 5 minutes of our complaint. That episode was indicative of our general experience with the staff. Other reviews I have read mention that the hotel is not kid friendly. I didn’t see anything that would have been kid unfriendly. However I do agree there is no particular draws for kids there. A lot of the beauty of the property and the quality of the service and amenities would be lost on little kids. 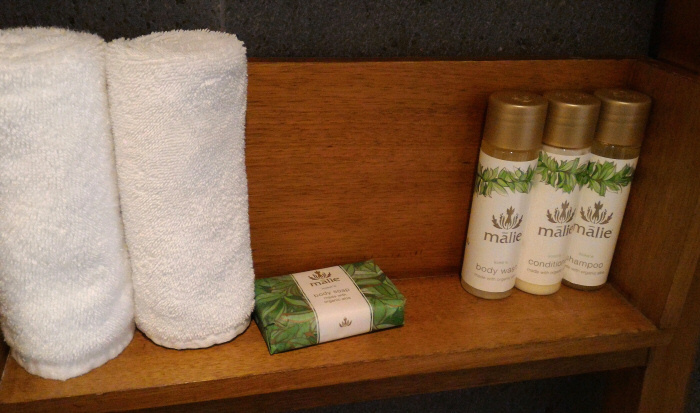 The Andaz Maui definitely markets to a certain demographic, and they cater to that demographic. We estimated the average age of guests was 28 (with a low standard deviation). Many were on their honeymoon. Of the 50 or so people we interacted with, only 4 were from the country’s interior. All the rest were from the East or West Coast. Of course most of the population is from the coasts, but I think it may indicate Hyatt’s success in attracting young, affluent professionals to this hotel. Don’t miss the coffee! The lobby coffee is available from 6:00 to 9:00 and then it’s gone. Ask for a room with walk-out access. The better view on higher floors isn’t worth the convenience of easy access to the pool area. Get your GoPro rental early; the first time we tried to get one they were all out the whole day. The same goes for any scheduled beach activity like the outrigger tour. The outrigger tour takes reservations and the list is sometimes days out. Don’t sweat the mandatory valet. I wasn’t looking forward to the extra step every time we wanted to leave the property. It seriously wasn’t a hassle at all. If you want a microwave and/or mini-fridge, request it as soon as possible; they are subject to availability. We called the morning of our check-in and the microwave was waiting in our room. Plan on snorkeling as early in the day as possible. When the surf rises later in the day, swimming around the shallow reefs can get dangerous. We met one couple with bloody legs who were smashed against the rocks while snorkeling in the early afternoon right in front of the hotel. Skip the $17 cocktails if you want. You’re not missing much; at least not $17 worth! Resorts on Maui seem to really roll up the streets at night. If you’re looking for lively socialization at night, the hot tub on the 3rd tier pool deck is your best bet. This entry was posted in Hotel Reviews, Hyatt, Trip Reports and tagged Andaz, Maui Vacation 2016 on October 2, 2016 by Gomanson. We had a great time at the Andaz also and we really enjoyed hanging with you guys. Also, I couldn’t agree more with your review of the Andaz. Keep the great posts coming and stay in touch, ESPECIALLY if you’re ever in the NYC area. By the way, are you guys on facebook?